While in the UK I picked up a copy of The Viva Mayr Diet by Dr Stossier and Helena Frith Powell. I wasn’t really looking for it or any diet book, but I follow Helena’s blog so was aware of it, had a look and was interested enough buy it. To say I devoured every word of it as I read it from cover to cover on the journey home is no exaggeration. 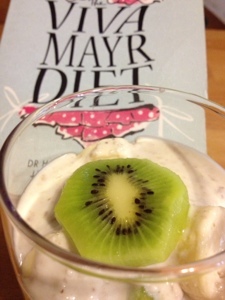 Like all good diets Viva Mayr isn’t just a diet but a change of lifestyle. The main thing that struck me was how much of it made sense and that with a little effort on my part I should be able to loose the post UK visit bloating and maybe even shift the 3 kilos from the Christmas UK trip that have now begun to bug me. For those of you who don’t know, my weight has been a big issue most of my life, but I have never been a yo-yo dieter as food is more important to me than a fad diet. I was tubby kid who became a short fat teen and stayed that way until about five years ago when I was in my mid thirties. Following no strict rules except eat less, move more and eat from the garden as much as possible I lost 15kg from 68kg to 53kg, which as I am only 1.55m tall was a much healthier weight. As with most women I ‘fluctuate’ so my ‘happy’ place is about 55kg, but as 58kg is getting to be the norm at the moment something needs to change before summer. The Viva Mayr way aims to improve the way our bodies digest our food ensuring we function efficiently and stay healthy (and slim). There is a lot more emphasis on how and when you eat than what you eat, to promote good digestion and therefore good overall health. Without wishing to give too much away here are my good and bad points from my first week. Once I remembered to chew my food properly (usually after the first 3 or 4 mouthfuls) I was amazed at how much fuller I felt than I usually do. This has meant cutting my portion sizes hasn’t just been easy it’s been essential. I have also not felt the need to snack between meals at all, all week – honestly! The bloating feeling in my stomach disappeared almost overnight. Exercise is already part of my routine with a daily dog walk, a weekly yoga class and gardening. However each week at yoga I promised myself I would do a bit of yoga at home each day. Before I knew it I was back in class wondering where the week had gone. Not this week. Now I drink my lemon and ginger tea before rather than with my breakfast, then wait a while before eating. Viva Mayr has given me twenty minutes of yoga time before breakfast each morning. Ade is a little irritated with some of my new habits! He is one of the fastest food hoovers I know so now that I am chewing more thoroughly I am taking a lot longer than he is each mealtime. This has made him a little annoyed. Now I am no longer drinking at mealtimes I am struggling to remember to drink enough during the day between meals. This is something I need to work on. Coffee is something to be avoided with Viva Mayr, however, I may only have one or two small coffees a day but I am not ready to give them up. Apparently pork is one of the most difficult of meats to digest, so it is suggested we avoid eating it. However as we have just bought half a pig for the freezer this isn’t going to happen either! Overall, at the end of week one I am really happy with my progress, especially as I feel healthier on the inside and slimmer, plus I have already lost a kilo. There is so much more to Viva Mayr than what I have put here so if you think is sounds interesting I really do recommend getting a copy of the book and having a proper read. I can't imagine trying to diet in France. I'll take a look at the book though since you think it's worthwhile, and since I'm not in France, I have no excuse for not changing my eating plan. It would be hard to really eat like the French and follow this to the word! However I'm not very good at following anything to the word, but there is a lot here I will take with me and does seem to give the results I want! I too have a problem where in the minute I am on a "DIET" my brain goes into this crazy mode and I think about food the whole day which sort of defeats the object, but as I always say the summer will soon be here and we can always eat more healthier in the summer. I agree, when you can eat from the garden it is so much healthier! Food is never far from my mind, diet or not, but feeling fuller and therefore not hungry I have been thinking of it less than normal!